Does the church in the background yield a clue to the location? ! Thank you to Mike for pointing out the photo the original was reversed, here is the correct copy ! Even though it is not clear, this is a fascinating photo. The first van looks to be to LNWR profile and the door is relatively short, so maybe it is a 25ft or 27ft Motor Car Van? However, the door runners are to the left of the door. So, if it is an LNWR van, could the photo have been printed in reverse? Looking at Google, the church might well be St Ambrose Church Leyland, but not sufficiently clear to be sure. Further to my earlier post, I think there is a mark on the front corner of the cab roof. Could this be the carriage heat relief valve which should be on the right hand side - i.e. printed backwards? I think the leading CCT may be Caledonian, not LNWR. Yes, Mike is quite right, the photo is printed backwards. Otherwise the train is running on the wrong line! 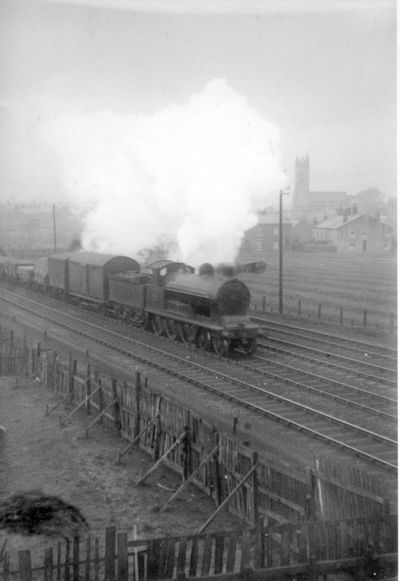 In fact it is on the Up Slow line just south of Leyland Station, and the church is St Ambrose.